Throughout history varieties of music styles have been integral to rituals of healing. 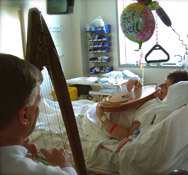 In contemporary medical settings, music's ability to promote healing and comfort is the result of combining the musical arts with science. The physical and emotional responses to music were once considered to be magical, mystical or unexplainable, but now with an understanding of brain functioning we are able to appreciate the biomedical causes of the musically influenced outcomes. Any change in the body begins with the brain. The brain interprets "sound" as "music" before that sound can exert a musical influence. (Taylor,1997 p 18). Music can have a positive effect upon both neural functions and hormonal activity, and therefore can influence the body's own immune and regenerative processes. Research has demonstrated the physiological outcomes of the influence of music. Among other things it can supplement pain control methods, influence heart rate, support respiratory distress by enhancing its depth, quality and rate. Beyond the biomedical explanations of the physiological changes brought about through music's influence, certain forms of music can play an invaluable part in supporting our complex, personal, human needs. This music can assist in bringing about meaningful encounters with each other, it can deepen spiritual connections and offer emotional support during intense personal suffering. The value of music in these realms is immeasurable. The work of the IMIM is to offer to the community music practitioners who are able to work skilfully with live music to offer physical, emotional and spiritual comfort through their music. Deakin University in partnership with St John of God Hospital conducted a year long research project into the effects of the music offered through the discipline of music-thantology. Their Report entitled "Relief of Suffering at the End of Life" was prepared by Emeritus Professor Helen Cox and presented at the prestigious Mayo Clinic in the United States (Mayo Spiritual Care Research Conference 2006). Copies of this report are available through the IMIM for a nominal charge.